Do you consider yourself an animal lover? Because David Backes of the St. Louis Blues is an animal lover. And unlike you, he’s willing to put his puppy where his mouth is. 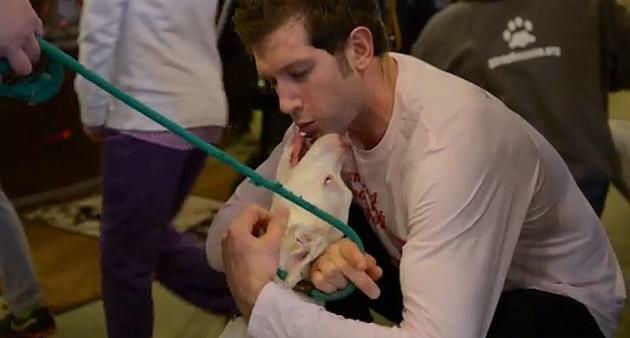 Earlier this season, Backes and Blues defenseman Barret Jackman took part in – we can’t even make this up – “The Great American Pooch Smooch & Kitty Kiss” event, in which people go from animal shelter to animal shelter laying lips on dogs and cats waiting for adoption. Also, please keep in mind that David Backes would like nothing more than to kiss your kitty.